Namibia is the true wild west of Africa. Home to the oldest and driest desert in the world, the deepest canyons in Africa and one of the best game reserves in the continent’s south, there is nothing tame or refined about the country’s wilderness. With limitless horizons and picture-perfect landscapes just waiting to be explored, Namibia makes for an action-packed and mesmerising holiday. From the deepest floors of Africa’s canyons to the highest peaks of its sand dunes, the warm waters of the Atlantic to the clear blue skies above, every inch of Namibia is a sprawling playground. Without a doubt, the nation’s dunes are one of its greatest attractions. But, rather than simply observing them from a distance, climb up the peaks and soar down on a sand board for an exhilarating experience. While most areas of the country are easily accessible, some parts are easier and more fun to explore by quad. There are numerous opportunities for hiking throughout Namibia. Some of the best spots include the Elim Dune and Big Daddy Dune (the highest dune in the world). A scenic flight will not only offer a birds-eye-view of the great land, but give you a greater appreciation for the wild nature of the area. For a more relaxing Namibia holiday, the coast offers luxurious spa retreats as well as water sports like kite surfing, windsurfing, diving and dolphin viewing. With one of the best wildlife reserves in Africa, Namibia boasts excellent wildlife viewing and once-in-a-lifetime encounters with some of the world’s most majestic creatures. Namibia is one of two countries that are home to the desert-dwelling elephant. It’s also the last place on earth where black rhinoceros can roam free on communal land. Whether exploring on a self-drive tour or with a seasoned guide, safaris in the game-dense parks and vast, tranquil desert are truly rewarding and awe-inspiring. Revered for its conservation efforts and dense population of animals, Etosha National Park is the nation’s flagship park. It is home to the big five (lions, elephants, leopards, buffalos and rhinoceros) and countless other animals. In the game reserves of the Caprivi, look out for hyenas, crocodiles, leopards and some of the more than 430 different birds and species of antelope. In Damaraland, those who are brave enough can track the desert-adapted rhinos on guided trips. In stark contrast to the vibrant grasslands of the park, the Kalahari Desert is spacious and desolate. Here, tours are a little different, but just as spectacular. With influences from all over the world, Namibia’s culture is wonderfully rich and diverse. Visitors are invited to discover local villages to learn about deeply rooted history and traditions and celebrate cultural practices and customs. The Bushmen are believed to be the first inhabitants of Namibia. In the Kunene Region of Namibia, the heritage site known as Twyfelfontein displays one of the largest concentrations of the group’s petroglyphs in Africa. The UNESCO World Heritage site provides a small insight into the hunter-gatherers’ customs while the people of Damara are believed to be the second oldest inhabitants. A reserve was established so that group could maintain its lifestyle. The uncompromising landscapes, the exotic animals, natural serenity and welcoming people make holidays to Namibia unforgettable. With some of the oldest sand dunes in the world, dramatic landscapes and majestic wildlife, Namibia is the perfect destination for those seeking an adventure-filled and action-packed holiday. The vast expanses of uninhabited desert, which encompasses both the Namib and Kalahari, are breathtaking. Rich hues of red sand provide a stark contrast against the clear blue skies; gigantic slabs of granite protrude out of the sand as if they were dropped there by accident, while riveting canyons give way to stunning rock formations and hidden coves. Whether it’s dune climbing, skydiving, sand boarding, hiking or flying, Namibia’s desert is nature’s marvellous playground. While Namibia is known for its active pursuits, its land offers visitors plenty of opportunities for more leisurely ways to enjoy its natural beauty. The saline desert and surrounding grasslands of Etosha National Park are home to an incredible abundance of wildlife, including lions, cheetahs, black rhinoceros, ostriches, flamingos and more than 340 bird species. There are plenty of guided tours and luxury camps in the park. And for those looking to escape the dry heat of the desert, there is always the western coast where golden sands invite you to spend the days getting a tan under the glorious sunshine. 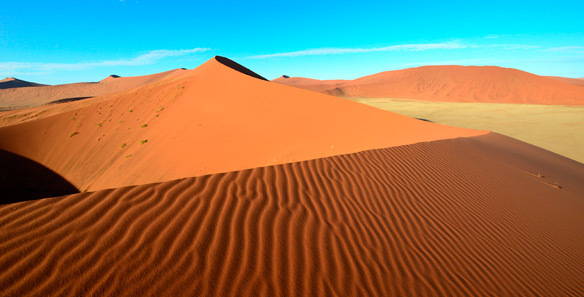 A trip to the auburn-coloured and astonishingly beautiful Sossusvlei Dunescapes sand dunes is not to be missed. Observe the big game and watch the flamingo gather at the salt mines of Etosha National Park. Elephant Encounters – Get up close to the rare desert elephants of Damaraland and look out for the black rhinoceros and antelope. Bask in the warm coastal waters and experience luxury at the German colonial resort town of Swakopmund. Meet with the Damara people and learn about their customs and traditions. Ready to head off on the adventure of a lifetime? For more information about Travelbag’s custom holidays to Namibia, contact us at 0203 139 7074 and speak with one of our friendly and knowledgeable experts. When packing for Namibia, keep in mind the temperature and climate of the different regions, as well as the different types of activities. You never truly know what you need until you get there, but try to pack as light as possible. Keep in mind that the summers tend to be hot and wet, while the winters are cool and dry. Additionally, temperatures can drop drastically in the early mornings and nights. Comfortable, lightweight clothing is great during the day. Bring light sweaters and jackets for evening. Neutral colours and moisture-wicking fabrics are ideal for safaris and outdoor adventures. Be sure to bring comfortable walking shoes and sandals and a bathing suit. To prevent heat exhaustion and sunburn, bring plenty of sunscreen, hats and sunglasses and lip balm. Salt tablets, electrolyte packets and rehydrating solutions are great to keep on-hand. Malaria is most prominent in the east, north and northeast. Therefore, anti-malarial are highly advised. Consult a physician to begin taking medication prior to venturing into those areas. Other medical items to keep nearby include first aid kits, anti-diarrhoea medication, insect repellent, pain relief, antibacterial cream and water purification tablets. Binoculars and a camera are essential for safaris and other outdoor excursions. Keep them nearby, as you never know what you may see. Also be sure to pack a torch, pocket knife and a sleeping bag and camp gear if it is not provided by the tour guide. If you are taking self-drive tours, bring a map, GPS and emergency contact information. Language – English is the official language. Afrikaans and German, among others, are recognised. With more than 300 days of sunshine a year, Namibian weather is a treat for visitors. There is occasional rainfall during the summer months of November to February but the precipitation is not heavy. Typically, the riverbeds, called “riviere", are briefly filled with pockets of muddy water, during which time a thin layer of lush flora develops. Since Windhoek is at a higher elevation, the summers there are still warm, but not too hot or unbearable. Visitors should avoid the Namib and north-eastern regions during the summer, because temperatures can reach a scorching 40°C. During the hot summer months, Namibians holiday in the coastal towns where temperatures are slightly cooler and there is a pleasant sea breeze and light layer of fog. During high travel season (April to October), the average day is sunny with blue skies and temperatures averaging 25°C. The nights tend to be cool and dry. The winter (July to September) is very dry, with temperatures around 20°C. In some areas, night-time temperatures can drop below freezing.